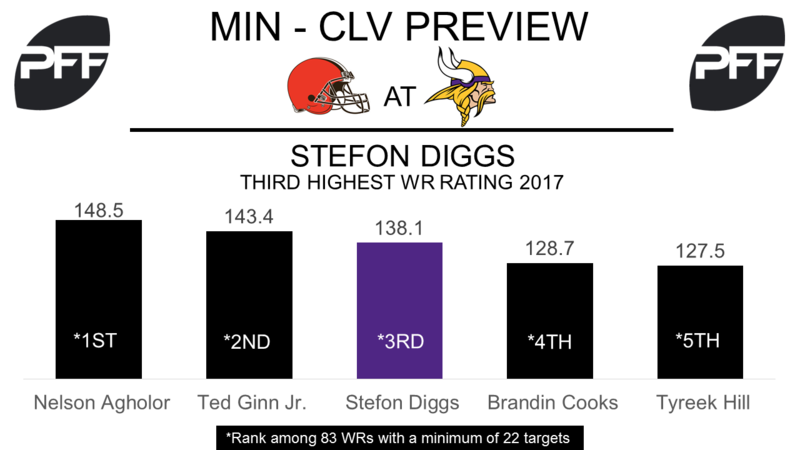 WR Stefon Diggs vs. CB Briean Boddy-Calhoun – Diggs, currently the fifth-highest graded receiver with an overall PFF grade of 84.8, has a change to match up against one of the biggest surprises at the cornerback position this season in Boddy-Calhoun. He is PFF’s seventh-highest graded corner with an overall PFF grade of 88.5. Diggs currently ranks third with a wide receiver rating of 138.1 when the Vikings quarterbacks have targeted him and currently leads the league with eight receptions on deep passes (a pass targeted 20 or more yards downfield). Boddy-Calhoun is only allowing 44.4 percent of the targets thrown his way to be caught this season, the ninth best mark among cornerbacks in 2017. Boddy-Calhoun has been a true shutdown corner this season, his 0.14 yards per cover snap is the best in the NFL and if these two square off one-on-one, it will be a battle to be sure not to miss. T Riley Reiff vs. Edge Nate Orchard – Reiff is yet to allow a sack this season but could have been in for a tough day against rookie sensation Myles Garrett, but Garrett did not travel with the team after being held out with a concussion. Reiff is one of only nine offensive tackles that haven’t given up a sack all season, although his 17 total pressures surrendered are the 23rd-most. Since making his debut in Week 5, Garrett has been one of the best edge defenders in the league and his PFF overall grade of 82.5 would rank 23rd if he had played enough snaps to qualify. With his injury, edge rusher Nate Orchard will see increased snaps. He has accumulated seven total pressures this season on 110 pass-rush snaps and has logged five defensive stops. His increased workload could possibly see these numbers grow with the matchup against Reiff. TE Kyle Rudolph vs. Edge Emmanuel Ogbah – In the run game Rudolph could struggled against Ogbah. Rudolph has been one of the worst tight ends this season against the run, his run-block grade of 47.6 ranks 44th among 69 qualifying tight ends in 2017. Ogbah on the other hand has been one of the best edge defenders against the run, his 13 stops in run defense are the fifth most this season and he has a run-stop percentage of 9.8 which ranks 11th (a run stop is a tackle made in run defense that results in a “WIN” for the defense). TE David Njoku vs. LB Eric Kendricks — Njoku has been one of the few players to show signs of life in Cleveland’s passing game this season. Among Browns’ wide receivers and tight ends with at least 50 snaps in route, Njoku’s 1.47 yards per route run (17th of 40 qualifying tight ends) paces the team by a solid margin — fellow tight end Seth DeValve is second at 1.26. Njoku should spend much of the day matched up with Kendricks, who has struggled overall this season (48.2 overall grade) but has been solid in coverage (77.0 coverage grade). Kendricks has allowed just 0.76 yards for every snap in coverage, tied for eighth-best among 46 linebackers with at least 140 snaps in coverage. T Spencer Drango vs. Edge Everson Griffen — As if things couldn’t get any worse for the Browns offense, they’re now in the unfortunate situation of having to replace one of the best tackles in football in Joe Thomas, whose 86.4 overall grade is tied for the second-highest among tackles. In his place, the Browns will insert second-year lineman Spencer Drango, who earned a 42.9 overall grade in his first action this season in relief of Thomas last week. The former Baylor tackle played 586 snaps at left guard in his rookie campaign, putting up a solid 70.8 overall grade. He’ll face a tough test in his first NFL start at tackle, squaring off against Everson Griffen, who is one of just seven edge defenders with a 90.0 overall grade or higher this season. Griffen’s nine sacks, eight of which have come from the defense’s right side, are tied for the third-most among edge defenders. 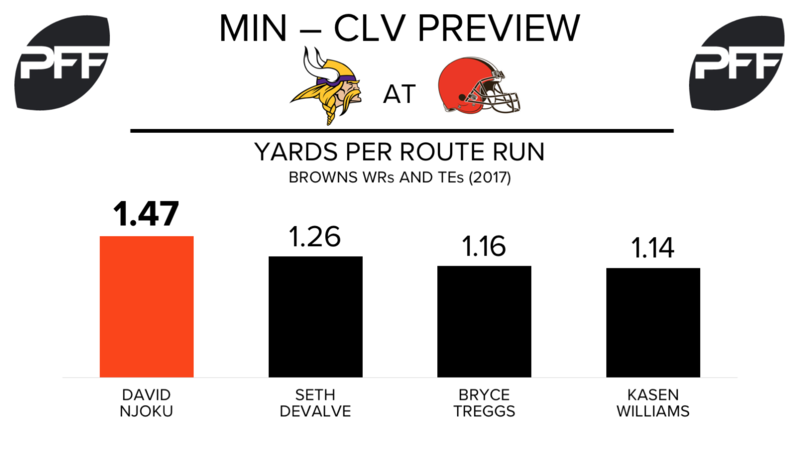 Browns QB vs. Vikings’ four-man rush — Hue Jackson has named DeShone Kizer the starting quarterback for this game, but if the past few weeks have taught us anything, that says nothing about who will finish the game. Regardless of who is playing quarterback for the Browns, they’ll have to find openings in a Vikings defense that prefers to sit back and play coverage. Minnesota has blitzed on just 23.2 percent of opponent dropbacks this season, the sixth-lowest rate in the league. Collectively, Browns quarterbacks have a league-worst 45.8 passer rating — throwing two touchdowns to 15 interceptions — when defenses opt to rush four or less.